The paper’s last social media account vanished from Sina Weibo this week. On Monday the Chinese authorities played one of the last cards in their war against the New York Times in Chinese cyberspace. Although the newspaper’s English and Chinese websites have been blocked since October of 2012, when the newspaper reported on the vast wealth of the family of Wen Jiabao, then China’s prime minister, the publication recently still had a presence on Sina Weibo. But this ended on Monday, when it was taken offline, to the chagrin of its 70,000 followers. This wasn’t the first time this has happened, but it was unusual in that on the same day, two weibo accounts labeled as belonging to New York Times staff were also taken offline – even though one of them had recently left the newspaper. The real-name verified weibo accounts of the paper’s technology writer as well as the former executive editor both disappeared along with the main account. Both journalists had been listed as employees of the New York Times. Inquiries with Sina Weibo regarding the reason for the shutdown were answered with three very telling characters – 网管办 (wang guan ban) – the Internet control authorities. 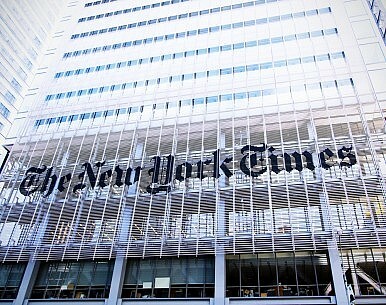 Given the timing of the removal of all three accounts on the same day as well as the reasons cited, it seems clear this is a direct move to remove the last vestiges of the New York Times from Chinese cyberspace – regardless of what content they were spreading. If this is the case, this shutdown is likely to be permanent. The New York Times’ Sina Weibo account didn’t tackle subjects with the same sensitivity as those in the publication, which is probably why it outlasted the other social media accounts of the Chinese edition of the newspaper. The Times previously boasted a number of verified Sina Weibo accounts as well as a WeChat account and a mobile app. One by one they have all succumbed. It’s been clear for quite some time that the Chinese authorities take a dim view of critical news coverage. This attitude was highlighted at a press conference in November of 2014, when Xi Jinping, standing next to U.S. President Barack Obama, responded to a question regarding foreign press coverage and visa restrictions on journalists by stating: “When a car breaks down on the road, perhaps we need to step down and see what the problem is.” The comment was seen as the most pointed reference yet to the government’s approach to critical press coverage. Even state media outlets are finding that coverage has recently been getting more difficult. One anonymous employee at a state-owned media outlet recently remarked that the topics available have become significantly restricted when compared to two years ago. It is interesting to contrast the woes being faced by the New York Times with the fate of Bloomberg. Both companies found themselves going through a trial by fire at the hands of the Chinese authorities, albeit with different responses. Bloomberg sorely tested the patience of Chinese censors with a report on the vast wealth of Xi Jinping’s extended family. That story broke in June 2012 – well before the New York Times report on the wealth of the family of Wen Jiabao, and before Xi Jinping even became President. The stakes were even higher for Bloomberg, which relies on financial terminals – and more important than the terminals themselves, access to economic information on the Chinese market – to make the vast majority of its profits in China, as well as a significant amount of revenue from foreign players dealing with the Chinese market. This is believed to have been the motivating factor behind the spiking of a Bloomberg story in November 2013, which reportedly would have forensically shed light on ties between China’s richest man at the time and top Party officials. Evidently, given the gradual removal of the New York Times’ presence from Chinese cyberspace, these decisions are still having ramifications. These days, Bloomberg and the New York Times both continue to operate businesses on the Chinese mainland, but Bloomberg’s websites and social media are not blocked. David Dawson is an Australian writer based in Beijing, with extensive experience in Chinese state media. The removal of the cartoon character is the latest example of Chinese social media giants' self-censorship.